Mooi werk weer van Foster + Partners en zoals altijd behoorlijk duurzaam ook. De uitbreiding van het Queen Alia vliegveld in Amman is in volle gang en zo tegen eind volgend jaar, begin 2012 moet alles klaar zijn. With many open-air gardens and naturally ventilated courtyards, air can easily circulate underneath the canopies to cool the interiors. Light will pour through the spaces in between the canopies and pools of water will reflect incoming light onto the ceiling while providing a comfortable microclimate. 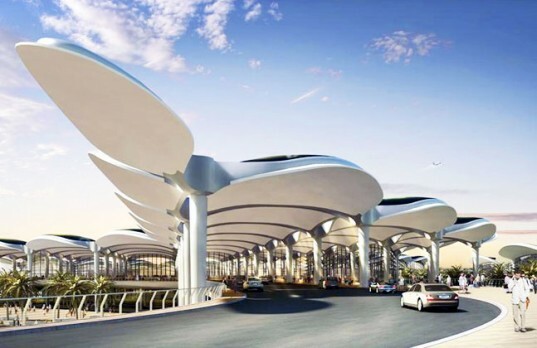 The roof canopy will also act as thermal storage to both heat and cool the building and it will also collect rainwater and night time condensation. Lastly, a bank of photovoltaic panels will be mounted on the roof to generate electricity. 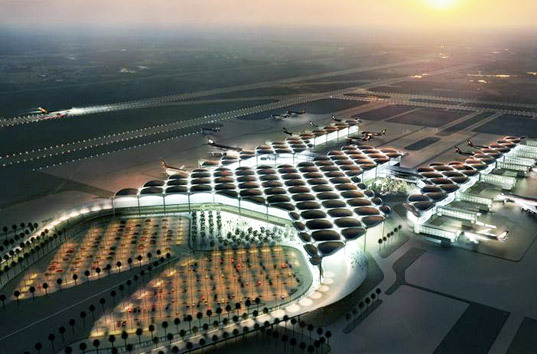 The expansion will allow the Queen Alia Airport, which is located about 20 miles south of Amman, to handle about 9 million passengers a year. Work started on the expansion back in 2005 and is expected to be completed sometime in 2011.